6.30 points at 23 votes (rank 569). A Mountie, the colloquial word for a member of the Royal Canadian Mounted Police, is a member of the national police in Canada. Mick is such a Mountie, who needs to survive the "Deathride" on an "Iron Horse". Thereby he carries the typical red-black parade uniform. 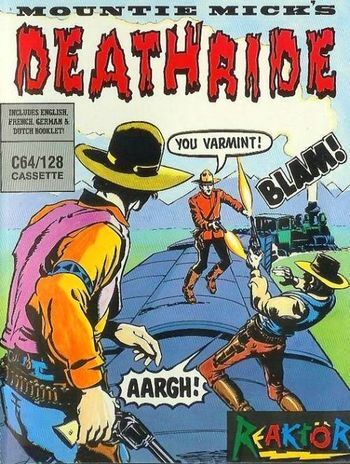 In Mountie Mick's Deathride the infatiguable Mick disturbs the McClusky gang in robbing the Trans-Canadian-Express. The gang takes flight over the rooftops of the train, but Mick is always on their heels. During this a lot of dangers lurk, such as emissive gas from leaking tank wagons, dangerous loads, grenades, dark tunnels, crazy elks and the attacks of the gang. Mick has not much time to catch the gang, as he will disappear from the screen to the right together with the moving train and lose one of his three lives, if he does not move fast enough towards the head of the train. Altogether he has to fight over 9 trains, whereby he gets from one train to the next with the help of a small trolley. Graphics: While the train drives over the screen to the right, the background with the Rocky Mountains also scrolls slowly to the right. By this the design gets a certain perspective. All possible colours are used. The single wagons of the train vary every now and then (tank wagon, boxes, car transport, ...) and also add an optical diversification to the game. In the foreground you see a fence most of the time, but also sometimes a river with a passing boat, from which they also shoot at Mick. Sound: During the game you also hear music, a composition by Ben Daglish, in which the typical "tsh", "tsh", "tsh" of a train was inserted adequately. Great! Right down at the bottom you see the full length of the train. Mick is on the red/yellow flashing wagon. Yellow wagons are the engines and red wagons are normal freight wagons or the caboose. The game can be controlled by joystick in port 1 or 2, there are always both ports active. Normally you shoot with the fire button, in ducked position Mick lays down a grenade which explodes after a short time. You can also simply jump on a bandit to defeat him. If you are out of ammunition, it is the only thing left, except for finding an ammunition box or committing suicide. You can walk along the train at the top or the bottom, if the wagon is not shut. There are ladders not only at the start or the end of a wagon but also sometimes in the middle. You can climb them up and down. Most of the time you jump from wagon to wagon or box to box by pressing jumping up and into the desired direction at the same time. But if you stand directly in front a box or between two boxes, then simply steer up and Mick will climb up. Mick can also shoot while jumping, first up, then while he moves up, press the fire button. As soon as he has arrived at the top, the shot will be released. To move the trolley you have to steer up and down constantly. You cannot continue in level 7. The path is blocked by a car. This seems to be a mistake in the game. Fortunately, there is another bug, which annuls the other: If you are fast enough and move our Mick to the left side of the screen (to the far left, until it doesn't go on any more) and then go even further he will go through the wagon (and other obstacles). But be careful, Mick should stop walking where there is free space, as he will get stuck e.g. in a box. 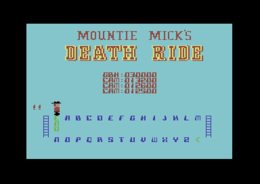 There are different cracks of Mountie Mick's Deathride, of which some are mentioned below. Due to a bug in level 7 the game could not be played to the end. Now you can pass the wagon with the cars without problems. Most of the keys react very slowly (you have to keep them pressed partially for over a second), therefore you could not press T (torch) or G (gas mask) as fast as you needed. Now all keys react instantly (including H and M). Many design problems (leftovers, wrong colours, etc.) were corrected. When the bullets disappear at the left side of the screen, they do not reappear on the right side. You could walk through wagons if you walked permanently on the far left. The music now plays with the same speed on NTSC and PAL machines. "Grey pixel" bugs on newer C64Cs and C128 were fixed. Mountains could appear in the wrong colour when leaving a tunnel. Stefan67: "I have only written the article, because the title screen caught my eye. At first the games seems to be nothing special. Simply shooting bandits and falling between the wagons onto the coupler and dying does not promise much fun. But behold! You also collect items as ammunition, bombs, gas masks, etc., which you have to use skilfully to continue. Even though you read mostly negative comments about the game, at least the music is the best in the C64 version in comparison to other conversions. I do not want to play through the whole game, but after some longer occupation with the game I have to raise my vote from 6 to 7 points." Robotron2084: "A really great cheapjack game, which unfortunately gets unplayable by the bug in the seventh level. Although the mere mortal will probably never reach this level, this is a reason for me to reduce my voting from originally 7 to 5 points." TheRyk: "Big wheels keep on turning... Let's start with good news: Ben Daglish is great as always. Graphics are not too bad either, though the ingame screen looks rather simple apart from the background. But the game... just horror! The terrible idea to restrict scrolling to one direction and being killed if you do not move fast enough to the left, makes the game far too difficult. Even worse, the controls are kind of finicky, too; when trying a jump, you can get stuck in front of a box due to the train's scrolling. In case you have made it to the last wagon of train 1 finally, you are supposed to use a handcar to fetch up with the next train. Ehhh... total nonsense in terms of reality or laws of physics, however, in the game it is at least almost impossible, too, unless you learned how to control that damn handcar. Meanwhile, the screen keeps on scrolling as before, i.e., you bite the dust when being scrolled out of the screen. Maybe I'm just too clumsy, but must the very first level really be that difficult? Kind of frustrating if you ask me. Actually, the game is pure trash in my opinion, offering nothing but great music and so-so graphics. Mountie Mick can ride to death an go to hell without me. Including music bonus I rate this 3 points." Monty: "Except for the slightly notchy controls and some bad unfair game elements, that are only manageable by memorizing, this would be a quite nice game. Buuut the bug in level 7, that makes it impossible to solve the game completely, pushes the voting fully into the low grounds. A game should be solvable at least in theory. But with Mountie Mick the ambitious player gets the middle finger, that all the effort was in vain. Noo, that way I give only one point. Otherwise there would have 5-6 possible." Colt Seavers: "Technically, I can only appreciate jumping on running trains to shoot bandits or trample on them, being a friend of the railway, stuntman and bounty hunter. Unfortunately, the controls are rather sluggish, which – in combination with the numerous deadly dead ends in the later levels - pushes the difficulty grade unnecessarily into astronomical heights. What a pity, otherwise the game is done rather nicely and also passably diversified, this could have been a real hit. This way, and also due to the bug in level 7, I give only 6 points." 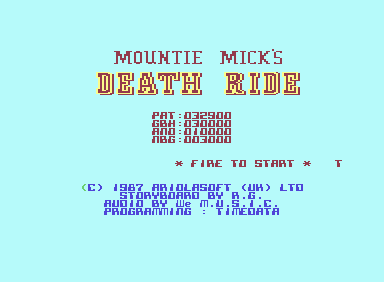 Demo on CSDb: "Mountie Mick's Deathride Music"
This page was last modified on 11 September 2016, at 16:06.